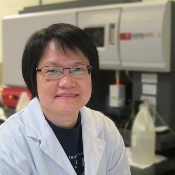 Annie Fu, with Econotech since 1990, determining metals content with the ICP-OES. Econotech's expertise and considerable experience in the field of Contaminant Identification has proven to be a valuable resource in the pulp and paper industry. We can identify contaminants and spots on your pulp or paper, as well as scales and general unknowns in your lines, tanks, and equipment. We use both classic chemical analysis and instrumentation ranging from optical and infrared microscopy to ICP-OES and FT-IR spectroscopy. We also help our customers by developing or adapting specialized testing procedures for their specific process control needs, and by providing product certification for meeting performance or composition criteria. Your contact is: Eric Chao.